Acclaimed bestselling children's author Jon Scieszka shared his five holiday gift ideas for children's books on "The Early Show" Saturday Edition. In 2008, Scieska was appointed by the Library of Congress to be the first National Ambassador for Young People's Literature. 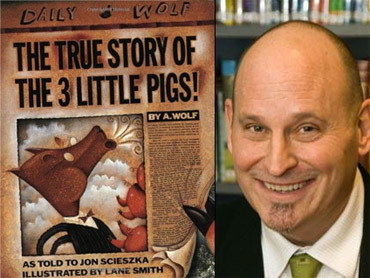 Scieszka is the author of "The True Story of the 3 Little Pigs!," which has sold over three million copies and has been translated into 14 different languages. He is also the author of the equally successful "Stinky Cheese Man, Math Curse," the "Time Warp Trio" series, and many more. "Polar Express" by Chris VanAllsburg - The beloved story of one boy's magical Christmas Eve adventure to the North Pole. Twenty-five years after its publication, this holiday classic has enchanted millions of readers around the world. Chris Van Allsburg is a luminary in the world of children's books. He has twice received the Caldecott Medal, for "The Polar Express" and for "Jumanji," as well as a Caldecott Honor for his very first book, "The Garden of Abdul Gasazi." He has also been awarded the Regina Medal for lifetime achievement in children's literature. Three of his picture books have been made into blockbuster movies. Chris Van Allsburg grew up in Grand Rapids, Michigan, and now lives in Providence, Rhode Island, with his wife and two children. For a fun, interactive Countdown to Christmas calendar, with a different game, contest, or activity for each day, visit PolarExpress.com. "Moon Shot" by Brian Floca - Simply told and grandly shown for a new generation of readers and explorers, "Moonshot "tells the extraordinary story of Apollo 11. Brian Floca is the author/illustrator of the 2008 Robert F. Sibert Honor book, "Lightship," as well as the highly-praised books "The Racecar Alphabet," and "Five Trucks." He also illustrated "The Hinky-Pink," a classic folktale set in Renaissance Italy and retold by Megan McDonald which received three starred reviews with numerous acknowledgements for his beautiful illustrations. Additionally, he illustrated Newbery Medal-winning Avi's "Poppy" and its companion novels. "Guess Again" by Mac Barnett, illustrated by Adam Rex - The rhyming text in Mac Barnett's debut picture book asks readers to fill in the obvious blank to guess what the obvious picture is, but when the page is turned, what's revealed is anything but obvious! You can't help but laugh at the wonderfully absurd and hilarious result of this book that makes plays on words, pictures, and your expectations! Mac Barnett was born to non-farmers in a California farming community, he now lives near San Francisco. He's on the board of directors of 826LA, a nonprofit writing center for students in Los Angeles, and he founded the Echo Park Time Travel Mart, a convenience store for time travelers. "Never Smile at the Monkey" by Steve Jenkins -- When it comes to wild animals, everyone knows there are certain things you just don't do -- tease a tiger, pull a python's tail, or bother a black widow. But do you know how dangerous it can be to pet a platypus, collect a cone shell, or touch a tang fish? A fascinating look at creatures that are more dangerous than you would expect. Steve Jenkins has written and illustrated many picture books for young readers, including the Caldecott Honor-winning "What Do You Do with a Tail Like This?" He lives in Colorado with his wife and frequent collaborator, Robin Page, and their children. To learn more about Steve, please visit SteveJenkinsbooks.com and to see a slideshow of his books, go to TeachingBooks.net. "Little Oink" by Amy Krouse Rosenthal, illustrated by Jen Corace -- From the creators of "Little Pea" and "Little Hoot" comes this tidy tale of a decidedly different pig. Little Oink is a neat little fellow. Clean, clean, clean, that's all he wants to do. But Mama and Papa won't have it! They say in order to be a proper pig, he has to learn to make a proper mess. Readers who hate clean up will love this humorous twist on a universal dilemma. Amy Krouse Rosenthal is an author, radio host and filmmaker. Her children's books include the "Little Pea/Hoot/Oink" series, "Duck! Rabbit!," "Spoon" and The New York Times bestseller "Cookies: Bite-Size Life Lessons." "Martina, the Beautiful Cockroach" by Carmen Agra Deedy, illustrated by Michael Austin -- How does a beautiful cockroach pick the perfect husband? Try the Coffee Test. A lively retelling of a great Hispanic folktale. "The Lion and the Mouse" by Jerry Pinkney -- The classic Aesop tale in a glorious, beautiful, wordless re-telling. All the World by Liz Garton Scanlon, illustrated by Marla Frazee -- A lyrical celebration of the whole world that feels just right. "The Elephant and Piggie" series by Mo Willems -- A whole mess of funny true friendship tales about two best pals. Perfect for just beginning readers. "The Case of the Case of Mistaken Identity" by Mac Barnett, illustrated by Adam Rex -- Very funny mystery adventure. And it's a series! "The Last Olympian" by Rick Riordan -- Book 5 in the Percy Jackson series. Greek mythology in the modern world. "The Magician's Elephant" by Kate DiCamillo -- No one can spin a tale like Kate DiCamillo. And this is a beauty. "Max" by James Patterson -- Book five in the fantasy/thriller Maximum Ride series. James Patterson knows the secret of how to get kids reading - write something exciting for them to read. "Candle Man, Book One: The Society of Unrelenting Vigilance" by Glen Dakin -- Murder, mystery, and steampunk adventure to get your favorite guy reading. "Going Bovine" by Libba Bray -- Crazy, fun, weird, sad, and weird. Also very good. "Stitches: A Memoir" by David Small -- A stunning mixture of art and text telling an amazing personal story. "Lunch Lady" series by Jarrett Krosoczka -- Total fun superhero illustrated storytelling. "Fashion Kitty" by Charise Mericle Harper -- A litty with the super powers to help other kittens with their fashion and other personal problems. Exquisite good fun.